Do you want a hardscaped area that is still green? 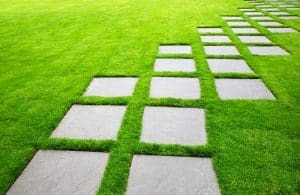 Traditional methods of hardscaping make this impossible because you have to make a choice – grass or paver. Well, grass pavers allow you to enjoy the best of both worlds. Grass pavers come in a number of options; you can either lay pavers that are invisible and sit underneath the turf or, you can lay pavers that sit within the turf, so both are visible. The advantage of both of these options is that the pavers help to disperse weight and protect the turf from being compacted. This means you can have grass on your driveway and high-traffic areas, without worrying about losing grass cover or damaging your lawn. The other advantage is that by including the turf, your hardscaped areas become perfect drainage points. Any water that collects on top of the pavers will be drained through the grass, and you’ll put water back into your soil which will feed your whole garden. The landscaping team at Everlast Services are experts in all types of lawn pavers, and they will be more than happy to visit your home and discuss the best option for your area. Why Choose Everlast Services for All Your Grass Paver Needs? When you choose Everlast, you have experience on your side. 20-years in the industry has given us the knowledge to inform you on which lawn paver solution will work best for your property your slope and your drainage needs. We also know how to design the project to fit perfectly into your budget. You’ll love the care and respect that each member of the Everlast team shows to you. As a family-owned company, the first rule at our company is respect for the customer. We don’t exist without you, and that’s why we bend over backwards to ensure you’re completely happy with the services we provide. We source all of our turf and pavers from local suppliers. They reward our loyalty with discounts on top products, which means your lawn paver project may cost less than you’re expecting. We also offer fencing, decking and concreting services in addition to our end-to-end landscaping line. So, if your project is Bigger than grass pavers, you’ll be happy to know that we can take care of everything for you.